Mayor Billy Kenoi testified during his own criminal trial Wednesday that he made personal purchases on his Hawaii County credit card but denied trying to steal public funds. Tribune-Herald. 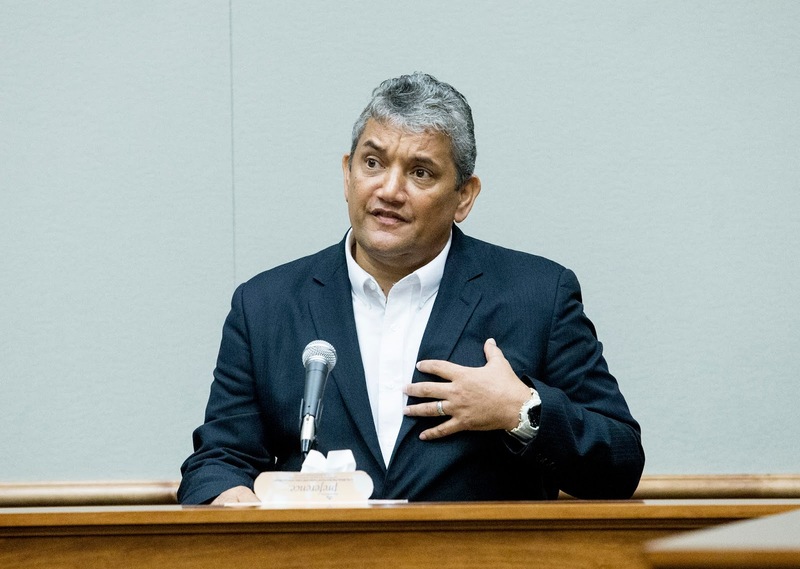 Mayor Billy Kenoi spent four hours on the witness stand Wednesday defending alleged personal charges to his Hawaii County-issued pCard that Kenoi said were for legitimate county purposes at a time of economic uncertainty. Star-Advertiser. The trial of Mayor Billy Kenoi entered its fifth day on Wednesday. The mayor – who in March was indicted by grand jury for two counts of felony theft, two additional counts of misdemeanor theft, and one count of false swearing – took the stand in his own defense this morning. Big Island Video News. Big Island Mayor Billy Kenoi took the stand at his felony theft trial Wednesday, telling jurors that he thought it was OK to use his county credit card for personal charges as long as he paid taxpayers back. Hawaii News Now. Hawai‘i Island Mayor Billy Kenoi testified in his own defense Wednesday. The criminal trial against the Big Island mayor for the alleged misuse of his government issued purchasing card entered its fifth day. Kenoi took the stand, appearing emotional, as he recounted his family and upbringing in Kalapana. Hawaii Public Radio. Big Island Mayor Billy Kenoi's theft trial continued Wednesday in Hilo with several witnesses taking the stand, which included Kenoi. KITV. Day five of testimony in Big Island Mayor Billy Kenoi's theft trial continued in Hilo Wednesday with the mayor taking the stand. KITV. Hawaii Island Mayor Billy Kenoi took the stand in his own defense Wednesday. KHON2. The state Board of Education will search for a new schools superintendent to succeed Kathryn Mata­yoshi when her contract ends June 30. Star-Advertiser. Kathryn Matayoshi is apparently on her way out as superintendent of Hawaii’s public school system. Civil Beat. Kathryn Matayoshi's tenure as the state schools superintendent appears to be coming to a close. Hawaii News Now. More Hawaii public school students are meeting or exceeding national science benchmarks, but achievement levels on the exam known as the “Nation’s Report Card” still trail national averages, results released Wednesday night from 46 states show. Star-Advertiser. Shoo-In Candidates For Congress Raise Nearly $1M, Spend More. Brian Schatz, Tulsi Gabbard and Colleen Hanabusa are not worried about losing this year, but they are making moves for their future. Civil Beat. All three members of Hawaii’s congressional delegation scored high marks on the Food Policy Action’s National Food Policy Scorecard, which ranks lawmakers’ votes on issues relating to food safety and access, farm subsidies, animal welfare, labeling requirements and the effects of food production on the environment. Star-Advertiser. Howard Hughes Corp. plans to distribute $1 million to Hawaii community organizations for a second time through a foundation it established in 2014 with an initial $1 million donation. Star-Advertiser. U.S. commercial fishermen hauled in 2.5 million pounds more bigeye tuna last year than they did in 2014, landing almost all of it out of Honolulu, according to a federal report released Wednesday. Civil Beat. The Honolulu Authority for Rapid Transportation’s new interim director, who’s expected to be announced today, will inherit a rail agency that has seen high turnover among managers and board members in the past two years. Star-Advertiser. Valuable properties are left unused to make way for rail. According to a report from the Honolulu Authority for Rapid Transportation, it wants to keep buying land, even though construction is still years away. KHON2. Proposal Asks Voters To End Council Earmarks For Nonprofits. The Honolulu City Council approves millions in extra funding for nonprofits, but the mayor frequently holds back the money. Civil Beat. Two key state lawmakers say they plan to try again to pass legislation requiring all moped riders to wear helmets in the wake of Tuesday’s fatal accident near the University of Hawaii at Manoa campus. Star-Advertiser. An online map showing what areas on Oahu are experiencing power outages is live. Star-Advertiser. Members of the Banyan Drive Redevelopment Agency voted Wednesday to approve a draft conceptual plan that will guide future action on the Hilo peninsula, particularly in terms of developing additional hotel capacity. Tribune-Herald. How ya gonna keep ‘em in prison, after they’ve worked down on the farm? West Hawaii Today. A Big Island native and former editor of West Hawaii Today resigned from his CEO post of the U.S. Space Foundation on Monday, about three weeks after coming under fire for making crude Facebook comments about Hillary Clinton. Tribune-Herald. The use of reusable plastic bags and polystyrene food containers in the county will be considered on Monday, Oct. 31, at 1:30 p.m. in Maui County Council Chambers. Maui Now. Native Hawaiian activists confronted U.S. Army Corps of Engineers officials about Wailuku Water Co. permits to repair damage in Iao Valley from the Sept. 13 flood at a forum in Wailuku and in a separate action requested that the agency revoke the water company’s permit for emergency work in the Wailuku River. Maui News. The Maui Planning Commission on Tuesday approved a state Land Use Commission special permit for Lona Ridge in Wailuku Heights, an action that moves the property one step closer to being able to host commercial events, such as weddings, workshops and corporate and nonprofit receptions. Maui News. Hospitals’ future a focus for both candidates in District 8 contest. Maui News. Farming a primary concern in District 13 matchup. Maui News. An executive at one of the world’s largest and most active venture capital firms has purchased a Hawaii estate for $5 million, Pacific Business News has learned. Rupert Rowe says the Kaneiolouma heiau complex in Poipu represents the storied history of Hawaii. Garden Island. Kauai County Mayor Bernard Carvalho, Jr. will be the keynote speaker at the Lihue Business Association’s annual meeting at Duke’s Canoe Club today. Garden Island.